". . . no birds I had known before gave such an impression of distinct and vigorous personality as these. They had such a gift of being entirely alive and joyous in a world that I had begun to think unhealthy and abnormal." Like all other birds that appear in large dominating groups, starlings have a bad reputation. 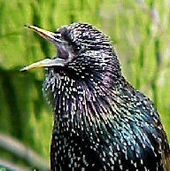 Many gardeners who feed the birds are irritated by starlings. Not wishing to challenge the common view (would I?) I have to confess I have a soft spot for starlings. Starlings were the first birds I heard on my first morning in this house, as they assembled on a nearby meeting point and squawked and called at 5am, as I sat in my new garden. "The sun was just coming up, filtering through the lacy fretwork of beech twigs, and I caught the glint of colour on their wings and back . . . they were clad in shimmering garments of iridescent blue, steel green, purple." 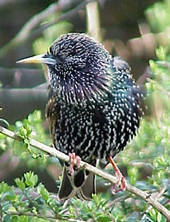 At that time (1996) there were large numbers of starlings in the area. In recent years their numbers seem to have decreased. I found a young starling stuck in our chimney once. This was brought to my attention by the cats very helpfully staring at the chimney breast with great attention, which alerted me to the slight scuffling noise. The fireplace, an old unused one, was, fortunately, blocked only with a piece of plywood, but getting it out was still a great palaver. This young starling hopped out happily, looking fearless. I've heard starlings called the 'teddy boys' of the bird world, and it seems a fitting (if dated) description, the way they strut about, in their rather shiny plumage. Starlings are brilliant to watch when they have baths. They're very enthusiastic birds, and every year come along to our Morello cherry tree and enthusiastically strip it of its cherries as soon as they turn red, and before we get chance to pick them. Similarly with many of the apples on the apple tree. Still, I have a soft spot for them. David Grayson's Adventures in Solitude, written in 1932, describes the author's stay in hospital. Listening to the starlings outside the window helps him during his period of illness. In an effort to convince the doubters, I've included some of David Grayson's words on starlings on this page. "They too . . . had their own low whisper songs, though with them it was scarcely song at all, but low, musical ejaculations and gurgling notes, and from time to time, as though some of the gossip had passed utterly beyond the pale of credibility or propriety, some bird would break in with a kind of ironical whistle, high, clear, and sweet." "It was not the mating season, not yet the gala time of year when the happy business of feeding the young birds is afoot: but the starlings, apparently without a care or responsibility in the world, were nevertheless enjoying themselves prodigiously, exchanging the most delicious bits of gossip, mimicking their neighbours and whistling ironically to one another." "How pleasant and yet how rare it is, whether among birds or men, to find such a mood of easy enjoyment where there is neither love-making nor business in hand! Enjoyment of the delightful little daily things of life: a fine morning, good companions, the sound of one's own songs."